Podcasting experiences a steady growth of listeners and becomes more influential amongst all group ages. Podcasting fits our busy lives and is a great source of accessible information. Unfortunately, existing solutions do not give enough attention to all opportunities of this medium. This project explores the potential of podcasting and presents a future of this medium with a focus on connections between people. The research tackled two groups that coexist in the world of podcasting – listeners and creators of audio stories. Conversations with both groups revealed that both would benefit from closer and more involving relationships. Listeners would like to be more connected with creators and listeners. A connection could remove the filtering of thousands of options and embrace the most popular way of finding new content in podcasting – a word of mouth. Listeners would also like to share their opinion about discussed issues with others or ask for recommendations for exploring other interesting topics. As starting a podcast is easier than before, creators still struggle during their journey. Many beginners have troubles with promoting their show and finding listeners outside of their social circle. The more experienced creators, lose engaged listeners because they don’t know what listeners would like to hear from them. They lack the proper channel to communicate with listeners and get inspired. Cast3 answers on those issues. It is a platform directed to both listeners and creators of audio stories. 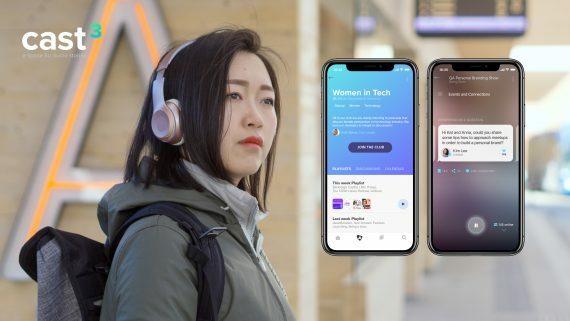 The platform uses a format called freecasting that improves a listening experience and respond to the existing needs of both groups. Instead of one big file, a freecast is divided into tagged chapters and is supported by visual notes or links. In a freecast, a creator can add elements whenever there is a need for it, for example, to reflect on comments provided by the listeners. Listening to a freecast gives the feeling of togetherness through sharing bookmarks with others, commenting on episodes inside a club or through live shows. During a live show, listeners can ask questions before the show and most upvoted ones will be answered by a host. During the live show, listeners can save interesting fragments or dive into a discussion on a chat. After a live show is done, they can see the summary of most saved moments and explore the mentioned topics. Cast3 also gives users a possibility to connect with similar minded people through clubs. The clubs are the spaces where listeners can exchange their thoughts or discover content through curated playlists. Clubs can vary in sizes, starting with private clubs only for a group of friends to big public clubs. The club purpose depends on its size and its members but can be used for discovery, discussions or live shows. In my opinion, Cast3 can change the way we think about audio spoken auditions and help to reimagine the podcast world by putting an emphasis on relationships between people to help them inspire each other and share their experience in the most convenient and engaging way.